Dia de los Muertos - It sounds so mysterious, Mexico's celebration for when dead relatives, both young and old, are allowed to return to the mortal world for two days to visit loved ones. Spirits coming down and walking among the living, sampling earthly treats and joining in the festival ... it sounds like a merry version of our Halloween holiday. But instead of scary goblins and blood curdling shrieks, the people in Mexico welcome the spirits of their families with the delicious smell of food in the air, tasty candies decorated like skulls, and lighted candles to guide them home again. Gravestones are decorated, and the whole family will gather in the graveyard to await and pay respects to the deceased. 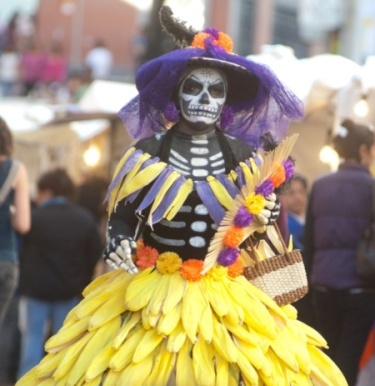 Follow the links below to learn all about this unique Mexican holiday of Dia de los Muertos. For the truly adventurous there is information on how to arrange tours to the more colorful events in Mexico and to take part in the celebrations. The terms and items associated with the Day of the Dead. Writer Marvin Perton shares the history and traditions of Dia de los Muertos, and where to find the best locations to participate or watch the real event. 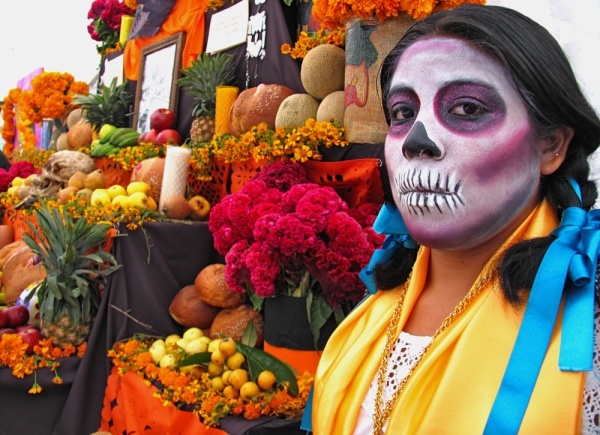 Day of the Dead - Oaxaca Comes Alive! The tradition is alive in well in southern Mexico. Learn how the holiday is celebrated in the southern state of Oaxaca, with photos from the area. The Day of the Dead was once a very important religious holiday in Mexico. 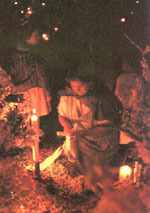 Over the years this holiday has been replaced by more commercial rituals such as those practiced on "Halloween" in the US. However traditional observances of Day of the Dead are still respected in southern Mexico, where indigenous customs and traditions are still very much alive. Photos of a visit to a border cemetery during the day. Thomas Whittingslow shares the history and event that honors the deceased loved ones in Mexico each year. The ghosts of Panteon de Belen, once a hospital cemetery, now a museum, walk the carefully manicured lawns...Story & photos by Hauquan Chau. Here we present the recipe for the traditional Pan de Muerto (Bread of the Dead). Considered one of the founders of modern Mexican art. This artist's popular art prints depicting Calaveras (skeletons) offered graphic social commentary in the years leading up to and including the Revolution. 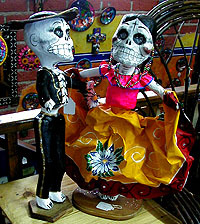 Even today, the use of Calaveras in cartoons or "staged" Day of the Dead altars offers pointed public mockery of our human weaknesses with the ever present inevitablity of dead hovering in the background.